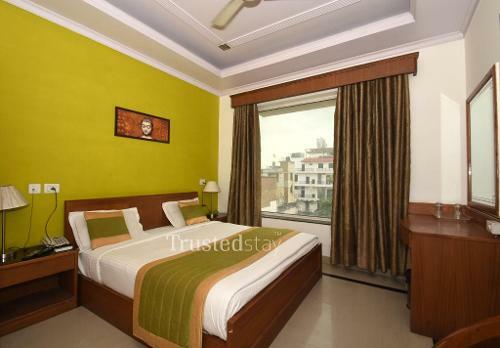 This Service Apartment in Gurugram is located in Greenwood City, Close to Delhi Public School and Ryan International School in Sector 45, about 6 kms from Info Technology Park in Sector 33, about 5.9 kms from Passport Seva Kendra near Udyog Vihar, Phase four, about 7.1 kms from DLF Cyber City, Gurgaon and about 15.9 kms from Indiragandhi International Airport. 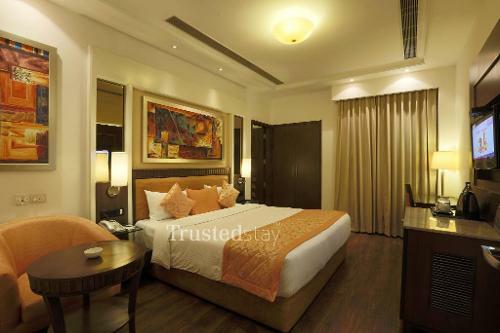 This service Apartment is having a choice of restaurants in the vicinity, Raj Restaurant is 900 m away, Capital Restaurant in secctor 31 is 2.1 kms away, Japanese Restaurant and Manhattan Bar Exchange and Brewery near H block is 4 kms away, Shopping Mall Galleria Super Market is just 3 kms away from this service apartment. This two storied standalone building Service Apartrtment offer a total Twenty nine serviced rooms, spread across in ground, first and second floors, in two wings. All rooms are spacious and fully furnished with AC, LCD TV and attached bathrooms, there a GYM area in this service apartment. There is fully functional central kitchen where breakfast and meals are prepared and served in the common dining area.